I would describe this scent as floral, somewhat sweet (not overly sweet), classy and a bit tangy. The longevity is not that great it's about 2-3 hours. I got this perfume a long time ago, at the time I enjoyed the smell but my taste has since changed and I'm not really a fan anymore. But the bottle is beautiful. This scent is extremely fruity and sweet. This is the kind of scent I love but my problem with this is the longevity, it literally lasts an hour on me. Terrible... just terrible. I'm looking for a perfume that suits my taste but that also lasts all day. I think this is discontinued but you can find it on ebay. But because it doesn't last long I wouldn't recommend it. It smells so fruity and sweet and feminine. I love it. It's affordable and though the lasting power is not 100% about 3-4 hours it's not too bad. Ahhhh I love it. This is a good mix of fruity and floral. It's a sweet, young scent which I really like it. At the end of the day you're left with a more musky scent which I find really pleasant. The longevity is great it lasts all day (6-7 hours). 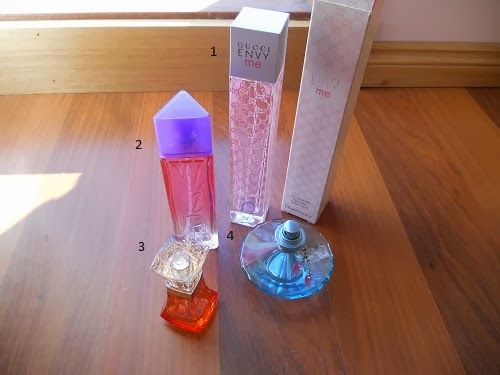 It's one of those perfumes that you can smell on your clothes when you finish wearing it. I received as a Christmas present a while ago. I did a review on the other scent here. I have the same opinions about this body wash as I did with the other scent. It doesn't lather properly, it was quite average however I did prefer this scent. It smelt like marshmallows which was nice but not a favourite. Honestly this smells like soap with a hint of peach (like a smidgen). It felt nice on the skin, it lathered okay and it was cheap. You can find this at The Reject Shop for $2-2.50. So if you're looking for a new body wash and you're on a budget this is pretty good. However I wouldn't repurchase it because I like trying different body washes. I get bored of the same scent. 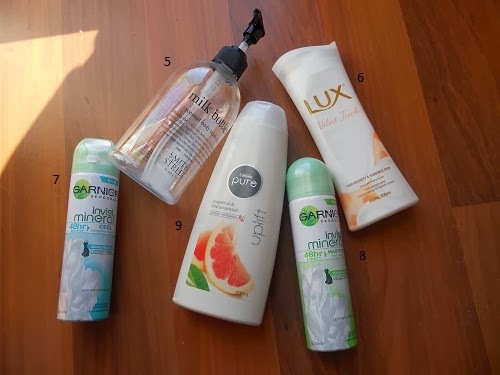 I really enjoy this series of deodorants because they work really well at keeping me smelling fresh. And they also have a really nice price point. I really like this scent, it's light and fresh and doesn't interfere with my perfume (because I want my perfume to be more prominent). Another plus is that it doesn't leave any white marks which is always a thumbs up in my book. The scent of this is a bit grassy (I really don't know how to describe this one) but not in a bad way. Once again it does what I want which is to keep me fresh. So yeah love the line of deodorants and will keep purchasing them but only at half price ;) However this particular scent isn't one of my favourites so I probably won't repurchase this scent. Smells exactly like it says...like grapefruit and lime but the grapefruit scent is slightly stronger. It smells amazing, it lathers nicely and it's cheap. This is another I got from The Reject Shop for $2-3. Have you finished any perfumes or body washes? Link your posts down below. I love reading blogs. Love reading empties! I havent tried any of this stuff yet! Hey you have such a cool blog. Follower, follow me: http://reneehartsthis.blogspot.com.au/ also come and enter my giveaway! I started following you. I look forward to reading your blog.